I think that somehow, somewhere, I must have angered the Powers That Be, because I think I have had this day already. Wake up, eat yogurt, ride the subway, ride a bus, visit the Met. We did this! I swear we did this already! The human male is resting his knee again today. Given her choice of ANYTHING to do in this city, the human female has opted to go back to the Met and look at more art. I would stay in the in and read or nap or stick needles in my eyes or something, rather than go back, but Sigyn is enthusiastic, and I need to keep an eye on her. I don’t trust the human female not to leave my sweetie behind somewhere. We are beginning with Egypt again today. I swear this woman has NO imagination. We saw mummy stuff yesterday, for Thoth’s sake! We didn’t see these yesterday, though. There is a whole room full of model boats, a veritable flotilla of funereal facsimiles. Or that’s what the labeling says, anyway. I think these are actually little dioramas left over from some children’s summer craft camp. We can’t tarry too long in here. Sigyn has that unfortunate compulsion to moo at bovines, so we had best move along before she starts and we all get thrown out. Funny as it would be to see the human female bounced from the museum, I know that Sigyn wishes to continue browsing. Moving along. There are whole rooms dedicated to armor and weapons! Maybe today won’t be a total dud after all. Ah! Didn’t see this yesterday either! What a magnificent suit of armor! My horns are better, though. (later) Sigyn and the human female have been standing in front of this one painting for half an hour now. It’s supposed to show a scene from a famous play. Let’s see: historical-ish theme, flowing clothes, graceful figures, cute dog… Yes, it does indeed tick all of the human female’s boxes for “what makes a good painting.” I think Sigyn just wants the red dress the one woman is wearing. And the dog. Here is a famous painting. Bwahahahahahahaha! Snort! Ahahahahahaha! Perfect! Great Frigga’s Corset, I couldn’t make this stuff up if I tried. The human female has just done something so quintessentially her. See this painting? She was drawn to it because of all the “brilliantly-rendered needlework” on the three fancy fellows. She read the title card to see who it was by, and the card described a “touching family scene, one in which St. Joseph features prominently. “Note,” the card says, “the sweet domestic still-life of fruit and wine in the foreground; very unusual for a painting of this kind.” No mention of kings or gold or anything of that sort. So she went and found a guide/docent/painting-herder and asked if the Met was quite sure that the right card was on the painting. That guide/docent/painting-herder went and fetched two more, and they all stood around looking wise and poking at their hand-held computers and debating. They finally agreed that this was, in fact, NOT the painting identified by the card. One of the guide/docent/painting-herders identified it as something else entirely. Apparently, in the last gallery re-shuffle, something went awry. So the human female, insufferably smug and wearing a ghastly know-it-all smirk, walked around for the next twenty minutes congratulating herself for finding an error in the museum. It was about then that she realized her purse was missing--money, cards, inn key, identification, Metro pass— all of it. Zoom! Genius to idiot in nothing flat. She had only her phone, and the battery was down to about 10%. How would she get home to the inn? How would she board her return flight with no ID? She consulted the museum map to see where the lost and found might be. She was able to locate it, and now we are standing at the security desk, looking over. And there is her purse, contents and all. I know what you’re thinking. Yes, of course, I took her purse while she was gloating and hid it. But Sigyn was starting to get a little panicky, so I settled for dishing out a heaping helping of crow and called it good. But the phone is still dying and the day is getting on, and the human female wants to try one more time to get tickets to go up to the top of that tall building. So, that is Enough Excitement and Enough Art for today! Goodbye, Met! (later) The female was able to procure tickets for 9:10 this evening. She has caught up with the human male for dinner. We are back in the tavern-like restaurant, and since the weather is turning cooler and damper, she has ordered a hearty chicken pot-pie and the male, shepherd’s pie. The food has finally arrived! We shall have to eat quickly if we are to make our ascent time. We have finished just in time to march smartly down the street for our Rendezvous With the Sixtieth Floor. It’s finally time! It’s exciting! It’s pea-soup foggy. Ehehehehehe! That’s three times I’ve prevented them from going! They’ve exchanged the tickets for tomorrow, which will be the very last chance, since it will be our last day. Since we are not going up, we have a little time to poke in this novelty store before it closes. I can’t decide if these are named after me or not. Odin’s Eyepatch! No matter where I go, I can’ get away from this idiot’s ugly mug. On that oafish note, I think I will call it a night. I crammed a lot of mischief into one day, and I’m a little tired around the edges. Mail’s here! Since yesterday was a no-mail holiday, there should be good stuff today! By Hulk’s hurtful ham-fists, will you look at the condition of this box that has arrived for the human male! The pointers I’ve been giving the mail carriers are really paying off. Well done! Yes, I think we can all agree that this acronym stands for Usually Smashes Parcels Significantly. Hope there was nothing breakable in there. Heh. The human female has a parcel too! Looks like the gorillas missed this one. I see I have some re-training to do. I have no idea what she’s ordered. Let’s look, shall we? Sigyn, is that anything you recognize? I have to say that, sadly, I do not think it is fudge. Or rather, I now hope it is not fudge. Fudge should not BE that color. Well, I’m glad this came with promotional literature, because I would never have guessed what these are–little rubbery samples of sidewalk gasketting. You know, that stuff builders put between concrete slabs to allow for expansion? The humans’ front walk is missing quite a bit, and the spaces tend to fill up with soil and then grass. …and some of them are awfully deep. Some time in the not-too-distant future, when current world governments are but memories and my name is on every mortal’s lips and all kneel before Loki, it will be important to know how it all came about. This is my story of conquest. Adventures — The narrative arc of my greatness. Posts with plot. Naughty Loki — ’nuff said. 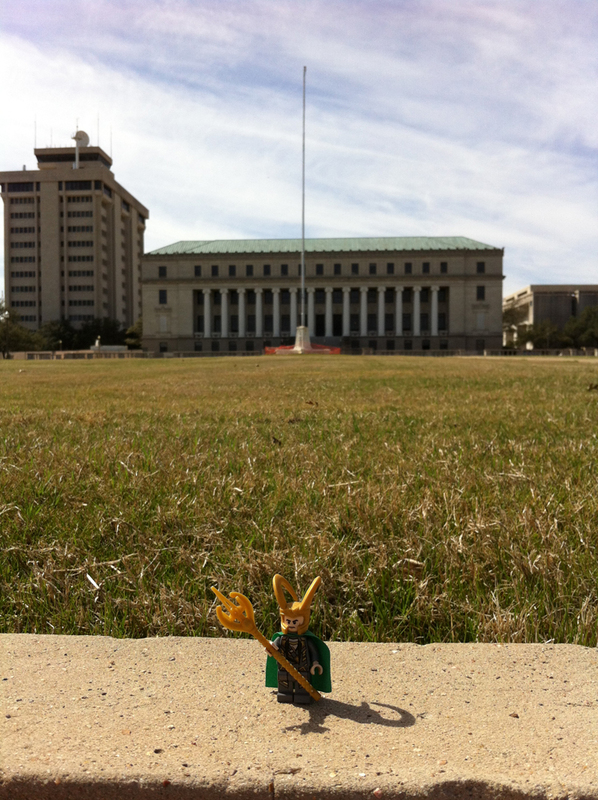 On Campus — I mean to rule Midgard, but I’m starting here, in Aggieland.